there is a universal lesson to be learned from watching your toddler at the playground, i think. i bring huck to this little playground a few blocks from our apartment on afternoons when we feel cooped up and need to stretch our legs. it is the perfect size for a man like huck. he likes to march his little toddler body with knees pumping high from one rock to the next, peering into puddles, stopping to consider pigeons, and shouting at the dogs on leashes outside the gate. recently, huck discovered the play structures. and since then . . . i feel like old mrs. bennett. my poor frazzled nerves! the universal lesson to be learned from playgrounds with toddlers, i suppose, is trust. there are times i have to physically restrain myself from "rescuing" him from those play structures and trust that he can do it. it's hard to take a step back, remove my cocooning arms from his tiny body, and let him try. let him reach. let him, maybe, hopefully not, but potentially, stumble. it's okay if he stumbles. 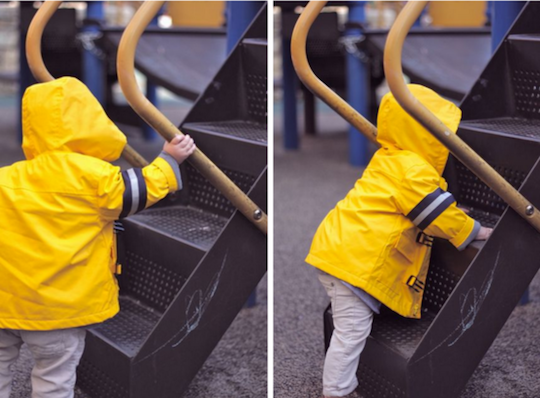 i know that by giving him space to climb and try, i'm giving him the chance to trust himself, and me the chance to trust myself, and i know that the next time he climbs those stairs he'll be even stronger, more steady, and more sure of himself. much less likely to fall. by letting him trust himself i'm allowing us all the chance to grow. that's the tricky part of motherhood, i think. knowing our limits, and then testing them just a bit. not too much. just enough. that this kid of mine is uh-mazing. here's to trusting ourselves, kid. Oh, I know the feeling all too well. One of the nice things about NYC playgrounds is that there seems to be a toddler section in most. I try to keep George confined to those areas, usually to no avail. Huck is adorable indeed. I just want to tell you A: That Huck of yours is incredibly adorable. B: You have the best way of expressing the emotions of being a mother..I look forward to it so much some day. and C: I look forward to reading your blog every morning. Thank you for sharing you life with me! You have inspired me to make a blog of my own! Thanks! Your little guy is seriously adorable. It's such a pull and push - and as they get older (and the dangers, greater) - the struggle to balance protecting them and letting go gets even harder. You're a great mom!!! These photos are lovely, Huck is the cutest boy ever! OH so true! My Mimi is thirteen months old and, well, you don't have to imagine because you know. What I find hardest is her grandmothers' voices in my head, telling me no no no! Do NOT let her touch the dirt! Do NOT let her tumble down that step! Do NOT let her taste the maple seed! Some days all that keeps me sane and sure of myself (as I watch instead of supervise) is Dr. Spock, telling me that she SHOULD do all those things. i love the photos of huckleberry. he looks like the ruler of the play structure and definitely knows whats up. you capture perfectly how being a mom helps us see things from a new perspective, helps us get through some of life's other tough challenges. p.s.- i love huck's raincoat! go huck! he's growing up and you're doing a beautiful job. Yes, your Huck is amazing! And my husband and I are excited for our own little huckleberry and to smooch his fat huckleberry cheeks (in July)! Love your way of expressing motherhood. Gosh I think this post could relate to almost anyone in any situation. We need to trusts ourselves know that we can be successful and happy, know that we are capable of handling whatever life throws at us. Great post thanks for sharing. If he does fall, comfort yourself with the knowledge that Tamsin once slithered through the railing on the play structure stairs and fell the height of five stairs on my watch, right in front of some moms, because I'd been checking my camera on the grass and hadn't noticed she'd gotten so high. MOTHER OF THE YEAR!!! She even made a sort of "splat" sound when she landed. Ugh. It was awful, and largely because it was so public and so my fault. Tamsin was okay after all, but I can't say the same for the 8-yr-old boys I mowed down to get to her. and here's to you for being such an eloquent writer. How old is Huck now? 15 months? My son is 2 now, and I think the period of time from 15-18 months was MUCH harder for me to trust him. I was terrified of the stairs in our house, the playground, the ocean. It was terrible, I was a wreck! Now he's bigger and stronger and listens better and wow, what a difference. We can do all those things without worry now. Love the idea of trusting yourself... I need to work on trusting that I'll get to where I want to be..
What a perfect little message. I know it will be very difficult for me to step back and let my little Eloise trust her own body one day. You are a strong mama. And that raincoat...too cute! Hick is one handsome little man. You are a good huckleberry mama! The best thing that ever happened to me was having an older child to watch after the younger. I could sit back and watch them play, and I didn't get all uptight thinking my baby was going to fall off the big toy, because big sissy was there to catch him. Your baby boy sure is a cutie! I love kissing big chubby cheeks! I love this post - the message, writing, and photos are absolutely beautiful. I have an 8 month old and have learned to trust myself and my mommy instincts so much in the last 8 weeks. Did you know that minor playground injuries actually promote brain development? Isn't that strange? It seemed to help my boy (and me too) to hear that when I soothe his scrapes and bumps along with a little Bactine and a Bandaid. Love his adorable yellow coat! Today of all days... thank you for posting this. I needed to hear what you had to say. "Here's to trusting ourselves" I could just climb up those stairs and slide down those words of yours... thanks for that, they just made my day. This one always makes my insides hurt! Thanks for sharing that sweet face and stylish attire with me! I look forward to it everyday! Lovely post. Between you and Pamela Druckerman, I think I'll perhaps not be terrified of my first baby when he/she arrives (one day in the future). I would love a cute huckleberry just like yours! He is adorable. And what a lucky little man to have you as his mom. Thanks for sharing! It is faith. Well said. that first photo - he is a man on a mission! Love this post so much.... even if it is just about playgrounds. Adoring your photos these days too! You are capturing such wonderful moments. Such a wise mama you are, Ms. Natalie. And oh, oh, for my own little Huckleberry. 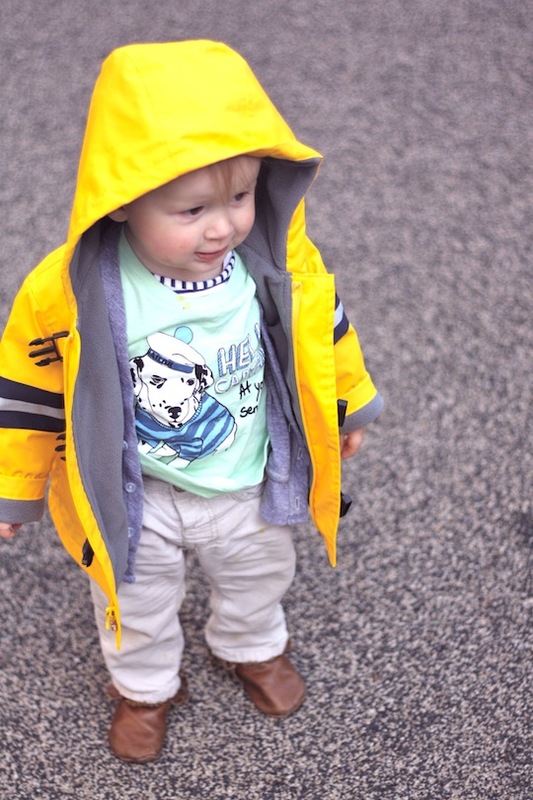 So, that rain slicker of Huck's is just the cutest thing! Where did you find it? I'd love to get one for my nephew. I read this yesterday and couldn't agree more! We've been taking our 15 month son to the playgrounds and i gasp and chase after him in case he'll fall and my husband stopped me and said "he's going to be ok. you have to let him try." So here's to learning that trust! 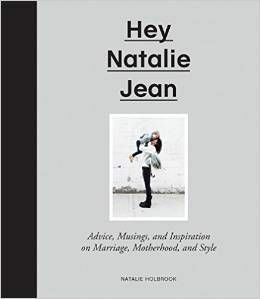 oy, my husband and i have been trying to have little huckleberry of our own for almost a year now. trust, faith..so much easier on paper. natalie. hope it all happens for you. I know that the moral of the story is to give kids space to grow, but ohmyheavenhavemercy do kids make me nervous. It's probably because I don't have any of my own, but I think they should all be born with a helmet. He's so cute! I have the same type issues with my babes and the playground. IT'S TIME FOR BED, HENRY HOLBROOK! HAPPY EARTH DAY! WITH THE GIRLS WITH GLASSES!